This thread is for discussion of the Chinese ESR meter clone and the open source German project AVR TransistorTester by Karl-Heinz Kubbeler and associated firmware. Some Chinese clones can be cheaply modified or updated and are suitable for those who wish to avoid creating a PCB or just want a cheap ESR meter. The original style Chinese clones (pictured below) can be purchased on ebay for as little as $10 including shipping. These are likely to be compatible with the project but there are many different designs being sold (see FAQ below). Manual (English) Version 1.12k (2017-01-20) But please check the project site for all current documentation and pdfs. There are two versions of firmware being developed for the open source project. The main difference between the k and m firmwares is that the k-firmware includes support for ESR measurement and the m-firmware has a simple menu system and a PWM tool. Both firmwares (k & m) for the transistor tester support in-circuit ESR measurement. Please see http://www.eevblog.com/forum/testgear/$20-lcr-esr-transistor-checker-project/ for more information. A convenient test lead setup is 4mm banana sockets and short crocodile clips or probing test leads, for SMD testing SMD probing tweezers. The voltage reference in the circuit is optional and if you put one in it will be detected by the software. The circuit may run at 3.3V but you will you will lose most FETs, SCRs & TRIACs and some measurement ranges will be also reduced. There are two standard headers for ISP, either 6 pin or 10 pin. You'll find the original circuit with the 6 pin ISP at http://www.mikrocontroller.net/svnbrowser/transistortester/Doku/tags/english/ (click "Download GNU tarball"). With some goggling you will find reference to the 10 pin header then simply trace Vcc or Gnd to figure out the orientation. If the LCD display is ST7565 compatible the k-firmware should work on the Chinese clones. You may be limited to the Chinese firmware otherwise. There is numerous different clones being manufactured now. The main differences are the package and memory of Atmega microcontroller used, ISP header or socket support, LCD screen, backlight, rechargeable battery, DC socket and if the voltage reference or crystal is present. Has anyone checked these out or own one? If they work $20 seems a bargain. Be interested to know their exact specs such as ESR voltage and frequency range for the DUT. Why even bother to hide the mcu? I have seen them before, the thing is there is no information about accuracy, on the pictures most capacitors seems to read well till you see the 1000uF one, it shows 673uF on one and 872 on other, lower values are looking good strange enough. Since I don’t use a LCR that much and still want one in my lab, I ordered UNI-T UT603 just to check out, UNI-T meters give me some confident, but I can imagine the quality is not same every time with UNI-T.
Boss earlier i used to see they have a dip type mcu.now they have a smd type .I am sure its the same as before only ,Can someone confirm .This AVR has some brilliant code in there .I am sure the accuracy can be improved by talking into consideration the code and some tweaks . You can find all details (docs, source code) at http://www.mikrocontroller.net/svnbrowser/transistortester/. The original version was done by Markus F. and Karl-Heinz started to improve the design and the firmware. Last year I joined in too with an alternative firmware. Karl-Heinz' current version supports the measurement of inductance and ESR in a very limited way (it's not done the classic way). Since the circuit isn't designed for those measurements it's suprising how much can be achieved with some clever programming. All other tests and measurements work well. The latest changes are about reducing the battery usage by the MCUs sleep mode (sleeping instead of NOPing for larger delays). Regarding accuracy you'll find some nice graphs in the documentation. Karl-Heinz did a lot of measurements with the tester and a LCR meter. I did too and tried to improve the measurement methods (that's what my alternative firmware is for :-). Capacitors are darn close now with the LCR meter and the tester. BTW, there's a self calibration function in both firmwares. It's strongly recommended since the MCUs and the PCBs may differ a lot. 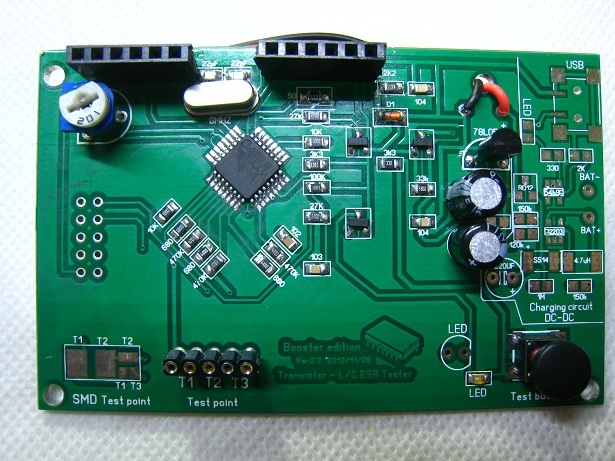 PS: The MCU of the tester from ebay is an ATmega168. And it seems that the PCB layout could be improved for higher accuracy. Same link as above (cd Software/Markus). I've also done a modified circuit with a current limiting PWM driver for the LCD backlight (benchtop instead of handheld), which is fully compatible with both firmwares but not uploaded yet. Can the device measure the ESR of capacitor in circuit or do they have to have to be removed from the circuit for testing? The Transistor Tester doesn't support in-circuit testing/measurements. Probably wouldn't be too hard to build an arduino version of this. Someone already did but it's got some drawbacks. Are You Called Mark With firmware Rev 1.05m ? .How Many Different people are making alternative firmware and releasing it in open source .Also i read the esr accuracy is now 0.01 resolution . Whats the difference between your and that other developer code ? Yep, Markus with the m-version. The original author is a Markus too :-) The original firmware was written by Markus Frejek and is obsolete by now. Karl-Heinz improved and extended the original firmware and still does. And I joined in by cleaning up source code and adding/changing some stuff. So we got two current firmware forks. The main differences between both forks is that Karl-Heinz' firmware supports more AVRmega models (with smaller flash size), inductance and ESR measurements (in a limited way). My version has a changed user interface, a milli-ohm measurement and some measurements are done in a little different (better?) way. For example I wasn't happy with Vf (Vbe) of BJTs, it was much to high. So I tried something else and Karl-Heinz improved his solution too. The nice thing is that Karl-Heinz and I learn a lot from each other. Whats the point then if each other take suggestions from each other and improve the code .Then why have two different tracks .I did read the code and the project in the afternoon today and i would say that you should not stick to the hardware frejek made .Might be its time for a little redesign and then taking the project to a higher level .Frejeks initial eye of attraction was a project my jeremy from peak electronics uk .Whom i am proud in representing as national distributor in india .They have taken DCA55 to a Higher Level ,They Have the DCA75 now and this is with computer interface .Even Dangerous Prototypes has a project just like this .Hence shake up your leg and take it to a higher level .Sign i still do not know about microcontrollers yet .I am learning the veteran 8051 right now and it will take a while IMHO .Then migration to other platforms etc would be easy . I got one of these months ago from some guy in china, about the same price, it did not work very well, it measured inductance at a quite low value and capacitors were lower then they should be as well. I tested multiple 680uH inductors for example and all tested much more than 10% below their rated value. Whats the point then if each other take suggestions from each other and improve the code .Then why have two different tracks . If you read my readme file you'll find the answer :-) Or just call it evolution or improvement by competition. I did read the code and the project in the afternoon today and i would say that you should not stick to the hardware frejek made .Might be its time for a little redesign and then taking the project to a higher level .Frejeks initial eye of attraction was a project my jeremy from peak electronics uk .Whom i am proud in representing as national distributor in india .They have taken DCA55 to a Higher Level ,They Have the DCA75 now and this is with computer interface .Even Dangerous Prototypes has a project just like this .Hence shake up your leg and take it to a higher level . The firmware should stay compatible with the old circuit design. If we would change the hardware design every six months for new features we would make a lot of users unhappy. This is a open hardware and software project, not a commercial venture. There are some ideas about a Tester+ with improved hardware but it would be much more complex (a lot of external components) and SMT-only. Since there are a lot of starters in the userbase I'm unsure if a Tester+ would be a great idea for them. Sign i still do not know about microcontrollers yet .I am learning the veteran 8051 right now and it will take a while IMHO .Then migration to other platforms etc would be easy . Not as easy as you think. The AVRmega runs nicely at 5V which is a good compromise for testing a lot of components. More powerful MCUs run at 3V which is too low and requires a lot of external components to drive 5V or even higher voltages with a decent current. Some measurements done with the AVRmega exceed the maximum I/O current. You have also to deal with MCU specific details like the internal resistance of I/O pins and so on. That's just the hardware. Optimizations for higher accuracy are based on the MCU. Another MCU family causes a complete rework of those optimizations. 3 : semtest - one hell of a project @ silicon chip and this months epe uk also has this project its three part project . Any links for that tester+ concept you are referring to markus . That's just an internal/private discussion at the moment. Yes, DPs project is based on a PIC. But I didn't know about semtest (got no subscription). Let's see. It provides quite high voltages but only 1mA drive current. That's much too low for power devices, like a 2N3055. There's a firmware fork and a shield for the Arduino now at http://www.pighixxx.com/lavori/ardutester/. Alberto used my code and is adding the ESR and inductance measurement functions from Karl-Heinz. I purchased this tester and found it to be quite accurate.Latest version. Certainly worth $20. With the exception on large capacitors which i could not verify as my HP tester is down. but large capacitors drift and vary a fair amount so a close call is probably OK. It is quite impressive that so many functions are packed in to a small unit. I note some are available in a box with a Zif connector I can make this modification my self even some strip board for the surface mount components. The board has some connections for USB and a battery charging circuit, any body have info on this? And it's not finished yet :-) Currently I'm working on an improved diode detection. Unfortunately not, since that part is added by the PCB designer, it's not an "official" feature. I purchased one of the chinese boards that says "Booster edition ver 2.2 2012/11/26 Transistor - L/C ESR Tester" on ebay. Signature bits confirms it is ATMega168. On this unit, the fuse bits were not locked, so I was able to read flash and eeprom info and existing fuse settings. I flashed Markus/ComponentTester-106m/ that was compiled for m168 but the LCD display seems scrambled. Has anybody else successfully flashed this device with the Markus fork of firmware? I read an older PDF description of this project that is very detailed and helpful. It suggested the Chinese clone boards need a 0.1uF capacitor on the ATMega168 for power decoupling across Vcc/Gnd. I'll probably try that next. EDIT: I forgot to program new fuse bits "make fuses; sudo avrdude ...." -- so now it's working. It's in continuous mode now, but I'll fix that. 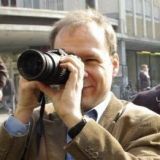 Karl-Heinz' documentaion is always up-to-date (http://www.mikrocontroller.net/svnbrowser/transistortester/Doku/trunk/pdftex/english/). In the German forum several chaps reported success with modifying (I should say improving :-) the Chinese testers and flashing new firmware. Simply press the test button a tad longer when powering on. PS: The new "m" version will have an improved UI and a new diode detection logic. Thanks for the link to the current documentation. I checked out the SVN repository, but didn't look under Doku for the current docs. I discovered the continuous mode and internal menu from the documentation in your branch -- I really like it! I'm using usbtiny from adafruit.com on ubuntu so I needed to change the makefile a bit to accomodate my environment. I like Karl-Heinz's use of serial output using PC3 (usart pin?) for output. Do you have plans to use this? Also - my Chinese clone board has a 2v zener for voltage reference, but I can't find any place in your code where to read the PC4 (ADC4) voltage reference. I measured my voltage as 1.955 volts, and wanted to specify somewhere in the code for precision. but I can't find it. My only problem now is during the self test or Adjustment modes, when I'm told "Create Short Circuit" and then connect all three test pins together, it does not proceed. I see in the code that it loops waiting to confirm all 3 points are shorted, but in my case it does not proceed. I confirmed resistance from TP1,2,3 back to input pins on TQFP32 ATMega168 - all traces are connected with expected resistance. I was next going to add a debug mode during Create Short Circuit to display shorted pins. I'll just write to line 1 LCD something like "12" if pins 1,2 are shorted. eventually it should write "1231" to show all are shorted. The serial output mode would be useful, to write debug messages to a terminal. Thanks again for our contribution on this project, I'm really excited to play around with this. If I make any significant changes, I'll post my code to my github account to share. No, but it's just a short and simple piece of code. No :-) The external reference is supported by Karl-Heinz' k-version. I decided to skip that feature because the external reference barely improves the accuracy for the 168 and 328. It would be much better to have a reference switchable between 1V and 5V for the ADC. But that would break the orginal design. The short circuit test sets up a voltage divider for two probes and expects the voltage at both probes being Vcc/2 +/- 30mV. That's done for all 3 probe combinations. You could check if Vcc is stable. Which voltage regulator is used? If you measure resistors or capacitors are the values ok or somewhat off? If you run the PWM tool and check the output with a scope does the frequency match? Add also the output of the measured voltages to give you a hint. The in-circuit ESR meters use a low voltage which is below the typical silicon threshold. That requires an opamp to amplify the low voltage at the cap and also high test currents which the TransistorTester doesn't provide. So the answer is: sorry, it won't work. Any suggestions for better component test sockets than the 0.1" female header used in the Chinese clones, sockets that will more easily allow insertion of a wider range of lead diameters? I've added 4mm banana sockets and use short test leads with crocodile clips or probing clips. For SMD stuff I use one of those SMD probing tweezers. PS: 1.09m is released (fixed pin assignment bug for MOSFETs, added IGBT detection and hFE considers leak current now). "One error is the assembly of the part "D1", which should be a precision 2.5V voltage reference. Assembled is only a zener diode. This part should be removed. You can mount a LM4040AIZ2.5 or LT1004CZ-2.5 precision voltage reference at this place. A missing voltage reference is noticed by the software, so that you must not install the voltage reference." I don't understand the meaning of the highlighted portion. It says that a missing voltage reference is detected by the software, so don't install one. That doesn't make sense. Has anyone found a suitable case? Wow! Looks like someone else thought of the zif socket idea. I was intrigued by this transistor tester and fancied making one myself, then found this chinese complete kit posted. It comes in a rather naff case, but with hook probe leads and a ZIF socket, seemed a bargain to me. I've got it, but no instructions. I shorted all the leads and reset it and it goes through an intruiging cycle of self tests then reports "Test End. Version 1.07k"
I notice all your firmware versions are 1.0xm - Can I flash your latest stuff? The great thing is the chinese box shifter actually sent me 2 of these by accident and so I don't mind fecking one up. (Hasn't asked for it back, and we do not have the luxury of free or even reasonably cheap international return delivery in the UK, so seller can whistle for it even if he finally works out his stock is -1). I will end up giving it away for free, as in gimme P&P and someone gets it for free. Where did the rest of this thread go? I could have swore it was more than 3 pages. There are a few threads that discuss these boards. All versions are available at http://www.mikrocontroller.net/svnbrowser/transistortester/Software/ (trunk = k-firmware under development, tags = releases of k-firmware, Markus = m-firmware). The main difference between the k and m firmwares is that the k-firmware includes support for ESR measurement and the m-firmware has a simple menu system and a PWM tool. Please see http://www.mikrocontroller.net/svnbrowser/transistortester/Doku/trunk/pdftex/english/, click "Download GNU tarball" and extract ttester.pdf. The m-firmware supports the standard schematic, 2.5V voltage reference, protection relay and external "high" voltage for zeners. the pdf is very complex. it's a transistor tester that can also be used to measure coils and capacitors? since I'm an arduino beginner: would it be possible to get some help to implement the code for the gLCD? will a step up converter be troublesome for measurement accuracy? Yes, but inductance is quite limited and the range for capacitance is 5/30pF up to 20mF (based on the firmware version). The Transistor Tester isn't actually designed for that purpose, it's more a "let's see what we can achieve" feature. For a LCR meter I'd use a completely different measurement method. The display shouldn't be any problem but it could require more I/O pins. I don't know if it would match the standard Tester circuit or if some design modifications are needed. The gLCD requires more code than a standard LCD module and you might need to store a font in the flash. There are some libs for such displays. The first step is to read the datasheet :-) A boost converter works fine (there's a HAM version of the Tester running with a lithium coin battery and a boost converter). Why color?, why not have goon connectivity to an computer? Recreating an curvetracer (faster than DCA75) would have been something.. I've recently discovered this circuit and I'm planing to make one. I have it already working on a breadboard! On Post 18 of this thread, I read that 3V is too low for testing most of the components. However, in the /Software/trunk, I found one make file in a folder "mega328_3.3V". Is there any version with the atmega running at 3.3v? I might be interested in this version because I'm thinking in using a 3.3v graphical LCD like the very popular found in the Nokia 3310. This LCD is cheap, has 6 lines and can do graphics more easily. The firmware only supports text based LCD modules at the moment. If you like to use a graphics display you would have to rewrite the display functions and adapt the component output, menus and self-adjustment. Hi Markus, thank you for the prompt reply. What about the possibility of the tester work at 3.3V? Is it possible without reduced functionality? I've been looking into the code and the most difficult part of adapting a different sized display is the fact that it was written mainly to the 16x2 or 16x4 format. With the display I have mentioned (based on the PCD8544), it's very easy to get 14x6 characters. Of course it will take some extra program space, but with atmega 328, I don't think it will be a problem. What if we create some middle level functions that will be between the main program code and the low level display functions. Depending of the display type defined in the makefile, this set of functions will adapt the output accordingly. As long as the display need only 6 data pins, the hardware could continue to be the same. You only have to choose which type of display at compile time, all the rest should be automatic. I think, with 3.3V you will lose most FETs, SCRs & TRIACs and some measurement ranges will be also reduced. Thank you for your replies, Markus. A new circuit just released the 28/03/14, he seems to have the latest features. It's just the basic circuit without hardware options. To get the latest firmware please download it at http://www.mikrocontroller.net/svnbrowser/transistortester/Software/ ('trunk' for Karl-Heinz' current version under development or 'Markus' for my version) and update your tester. Do any of these testers measure Vbe of transistors? Both firmwares (k & m) measure Vbe. Why are there two threads with almost the exact same same? I am con-f-used. BTW, v1.16m was released two weeks days ago. Got some minor improvements and a check for rotary encoders incl. pinout detection. Cool, I bought a couple of these meters, one with the large LCD and the standard 2 line model. I can't see any measurement for Vbe though, only Hfe. How do I flash the firmware on these machines, there seems to be no way to send data to them? Must be a quite old firmware version. Download the current k firmware at http://www.mikrocontroller.net/svnbrowser/transistortester/Software/trunk/ (click "
Download GNU tarball"), edit the Makefile (take a sample one from one of the subdirs) and "make". Get an ISP programmer and flash the ATmega. Your testers might need an ISP header. None of the meters have headers, although it appears I can solder in a header myself. One of the meters has a space for a 2x3 0.1 header, and the other a standard 2x5 0.1 header. Only problem is I have no idea which orientation they should be, or which side of the board I should solder the headers. I notice there are 4 pins at one side of the 2x5 header which all go to ground though, so that should help if I can get a pin out diagram. There are two standard headers for ISP, either 6 pin or 10 pin. You'll find the originial circuit with the 6 pin ISP at http://www.mikrocontroller.net/svnbrowser/transistortester/Doku/tags/english/ (click "Download GNU tarball"). And with some google-foo you'll also find the pinout for the 10 pin header, e.g. http://www.batsocks.co.uk/readme/isp_headers.htm Simply trace Vcc or Gnd to figure out the orientation. If that one works with avrdude or another software, it should be fine. Just needs also an adapter cable for the 6 pin ISP header. I 'm trying to compile the ComponentTester-trendy-1.26m at Atmel Studio 7. I created a new Solution (I think a 'Solution' is a container of projects) based on ATMega328P. I replaced the atomatically created code at main.c with the code of main.c at ComponentTester-trendy-1.26m. I copied all the files (except for the main.c (as I had copied the code)) from ComponentTester-trendy-1.26m folder to my project's folder. I didn't want to change the code, So I left everything as is. Why do I get errors? IDE quirks. IIRC, there's a checkbox for using an external Makefile. BTW, the current m-firmware is 1.32m. So, you 're saying I should use an external makefile? I should make it by my self? The source includes a Makefile which should be used. I used the makefile included in the source code and it compiled! But now I have another problem related to the hardware. I downloaded from here (I clicked on 'Download GNU tarball'). I suppose it also works for ATMega328P (according to this pdf), right? The current m-firmware supports ATmega328, 324, 644 and 1284. The file you've downloaded is an old circuit. You can configure the m-firmware to run on most tester models. The file you've downloaded is an old circuit. Could you please post a link to the latest hardware (and it's frimware)? The basic circuit hasn't changed much and you'll find the current circuits in Karl-Heinz's documentation (ttester.pdf). The latest m-firmware is 1.32m. Please see https://github.com/svn2github/transistortester for the files.